So my husband and I have been talking a while now about what project to do next. We have several on our list…my bug me list, to be exact. But since we can’t do them all at once, its about investigation, pricing, timing and well design! So in order to help decide what we do first, there are some basic steps or things we generally do such as get pricing, establish what is our current budget for a project we want to take on, determine a basic design in the case of a room design. Since one of the things we have been talking about is our living room, I am so all over this one for getting the prelim items done. In my case, it always starts with inspiration…something that gets me excited, captures the feel I want for a room and hopefully the colors I may have had flying around my head. The Living Room is Talking to Me…But is it Saying Anything? I ask does this room feel like it wants to be formal? casual? A bit of both? Traditional? Modern? Contemporary? Transitional? Is it feeling girlie? Masculine? Does it want to be eclectic? Is it feeling inspired by somewhere around the world or period? Often I personally find clues from around the room itself. Even in a completely empty room, it can give you clues. Does it have crown molding and distinctive architectural elements such as arches or columns or ceiling medallions? If so, its asking for some more formality and at least a nod to the traditional. Detailed molding of almost any kind almost demands some kind of formality, but that does not mean stuffy. Planation shutters a bit more casual? Tall cathedral ceilings, vaulted roofs and huge windows flanked by plain and unadorned walls or door opens tends to read a need for a modern feel, even if its a modern take on traditional. Light white washed wood floors almost screams coastal. The room will give you clues. In the case of our living room, its pretty cookie cutter. Strip away the furniture we have in it now as it has always been and is temporary, and we have a large white box with big ceilings and medium to dark laminate hardwood floors (man I wish they were at least engineered but that’s me). Its only architectural features are white plantation shutters on two windows but not the upper one and taller base molding. However, the greatness of the room (15 feet x 20 feet), tall vaulted ceiling, and open flow and view from the entry, dinning room, staircase, upstairs, guest bath and family room tell me this is a room that can’t be too uptight. It needs a modern or update take on it. Its not a traditional sitting parlor. Where the room is located plays a huge part in the feel it gives off. Is it located in and adjacent to all the other formal spaces or is it looking on to casual and more laid back rooms or both? 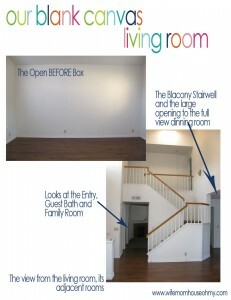 In our case, the living room is most visible and directly adjacent to our formal dinning room and entry. Secondary adjacencies are our family room and guest bath as well as the upstairs balcony. Of those, the family room is designed and pretty much at fully complete. There are a few things left. The same goes for the guest bath. The dinning room is fully designed and 1/2 way to its vision BUT the vision is complete. The entry has an inspiration piece and the stairwell balcony, well, has a family portrait gallery and that’s about it. So the rooms that hold the biggest influence are first the transitional and vibrant styled but definitely formal dinning room, second luxurious deep/moody guest bath and lastly our modern sleek and industrial casual family room. They do flow well but each has its own spin and feel. These tell me the room should feel more formal but not stuff and super traditional. It shouldn’t feel super streamline modern and contemporary either. It wants to feel vibrant, fun, with energy but a jewel box not a steam trunk. Its looking for a blend of traditional and modern, clean lines and detail that can be captured in fabrics, colors, textures and transitional furniture. For example, a traditional wingback chair with clean sleek modern lines and details with a traditional patterned fabric that is filled with more contemporary vibrant colors in a larger scale pattern. A balance between both. Often time the purpose of the room alone will dictate what it feels like it wants to be. For example, a sitting parlor most often dictates a formal gathering place for small scale (smaller scale) entertaining. The fact we have a separate living room and family room dictates that this room is more of a formal entertainment area. That alone dictates that its should be more streamlined, more “proper” and public entertainment area. Once the room tells me what it feels like, then I ask, well, given that, what do I like? What’s my personal style that I gravitate toward. What kind of rooms do I get inspired by or fall in love with. A really good way to determine key design words and styles that describe what you like and what styles you gravitate towards, is to check out the HGTV design portfolios. Each room list design elements and style used to describe their design. I suggest going through various room types, and see what you gravitate toward. Save the photo and records the words used to describe the room. Once you have about 10-15 rooms you really like and gravitate towards, see what wording keeps appearing. Odds are there will be one or two words that consistently show up on most if not all of your favorite rooms. I did this a long time ago and discovered I really lean toward transitional and very specific styling within transitional. I love traditional furniture styles that are done in a modern streamline/clean line way. But I like traditional to show up in the bling factors of a room or in tone on toned very traditional patterns in fabric or a traditional color and style fabric done on a modern blown up scale. For example, I adore a traditionally molded surround mantle on a fireplace with simple line detailed molding – no dental moldings are scrolled elements. BUT I adore it when its paired with a modern glass and stone mix face. As I design the room, I will keep those elements in mind as they will guide my inspiration. Inspiration can hit you from any where…probably why they call it inspiration. Usually, it is something you are drawn to or captured by. One of my favorite episodes of Sarah’s house had her inspired by these decorative shell balls with shades of lavender. Something so small inspired a massive room. But that can be the best jumping off point. When we bought our house, actually even before we bought our house, I had started thinking about what I would want a formal living room to read. I knew I have always felt that family rooms read cozy, intimate, inviting, relaxing, snuggle up, close “family” time. Living rooms are just that “alive”! So I knew I wanted color, nothing shy. I thought about the fact that living rooms are an entertainment space and grown up space. It needed to feel fun, inviting, sophisticated, adult but not stuffy, museum like. I imagined a vibrant palette softened by undertones of warm and cool grays to give it a more modern and sophisticated feel. So when we bought our place and our living room was a big open box, I was kind of excited….Blank Canvas!!!!!! 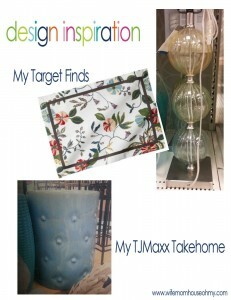 As it turned out, inspiration hit me at Target and grew at TJMaxx (so love that store and Home Goods) and online! I fell in love with this colorful placemat. So, no, the placemat was not going to end up in my living room but I loved the hues and blend and…wait for it…feel it expressed. It was what I had been imagining in my mind translated in this little piece of fabric, sans the red. I wasn’t reading red. I was loving the green tones, purples, teal-oceany blues, hazy yellows, grays and gray undertones. I loved the modern take on the traditional floral print. I had my inspiration…part one. Color. As I walked through Target, ironically not looking for anything, I came across these lamp bases that captured what I saw the room as. They were colorful but not in your face color, they had three of the colors and hint of a fourth in the brushed metal bases that were in the placemat I loved and they were adult sophisticated yet to me said fun. They nodded to traditional in the glass bulbs and texture but look felt more 21st century rather than 18th century. They found their way home. They would absolutely go in my living room. The last element of inspiration came at TJMaxx. I knew I wanted the unexpected or rather not traditional use elements for the room. And I wanted to have multi functioning elements. So as I was meandering TJMaxx…by the way, inspiration almost always happens for me, when I meander, not when I’m looking for inspiration. I saw a collection of outdoor ceramic cylinder tables. Now I happen to love these. I know they are trendy right now but there was this one that wasn’t the typical Ming Dynasty looking ones with open basket weaving I have seen frequently. This one was an oceany pale blue, solid but looked like a tufted button stool. I fell head over heels. It embodied that twist on traditional yet modern sense design I love. Plus, it could serve as both a traditional cocktail/side table AND it was sturdy enough to serve as extra seating! Sold! These three elements of inspiration guided my design for our living room. In fact, design is the next step in the process I use for determining which project to start next – inspiration, design, budget, decision then planned action. See you next post to see how the inspiration and the creating of inspiration turned into a functional design for the room.